AFC Bournemouth manager Eddie Howe is to be awarded the Freedom of the Borough in a council's final act. 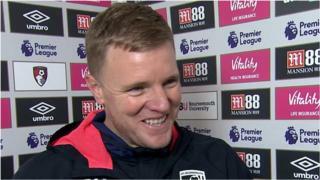 Howe was "the driver behind unprecedented civic pride" after leading the Cherries from League Two to the top flight in just six seasons, Bournemouth Borough Council said. The council is due to approve the award at a meeting in March, shortly before it merges with two other authorities. Howe said the award was a "great honour". "This would be an award not only for me but for the board of directors, the staff, the players and the supporters," he said. The manager would be the 28th recipient of Bournemouth's "highest award" which was first granted in 1902, the council said. It entitles recipients to a reserved seat at council meetings and church services, and to be addressed as "Mr Freeman". Council leader John Beesley said: "It is the Eddie-Effect that has permeated the town that really sets him apart. He is a unifying force." The proposal to grant the honour will be discussed at a special council meeting on 5 March and will be the last decision that Bournemouth Borough Council ever takes, the authority said. Eddie Howe was appointed as Bournemouth's caretaker manager in 2009 when the club was 91st in the league pyramid and facing relegation and possible liquidation. Under his leadership, the club was promoted to the Premier League in 2015.